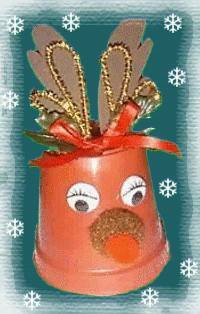 Recycle a clay pot, or a plastic plant pot, to make this whimsical pot reindeer Christmas ornament. 1. Paint the pot brown if you have to — I was lucky and bought these at the dollar store, 10 for a dollar. 2. Glue on the goggle eyes and glue on the medium brown pompom and glue the small red pompom on top. 3. Print and trace the ear pattern (shown at right), or draw your own ear pattern onto fun foam and cut out. Starting in the center of the pot, glue the ears on to the pot. 4. Bend the gold pipe cleaner in two loops and glue it in place, in front of the ears. 5. Add the holly leaves or other Christmas foliage, then tie a bow from thin red or green ribbon, and glue the box in front of the leaves. Why not make a herd of reindeer and use them as place settings on the Christmas table?